News | 2013 Beijing International screenwriting competition. 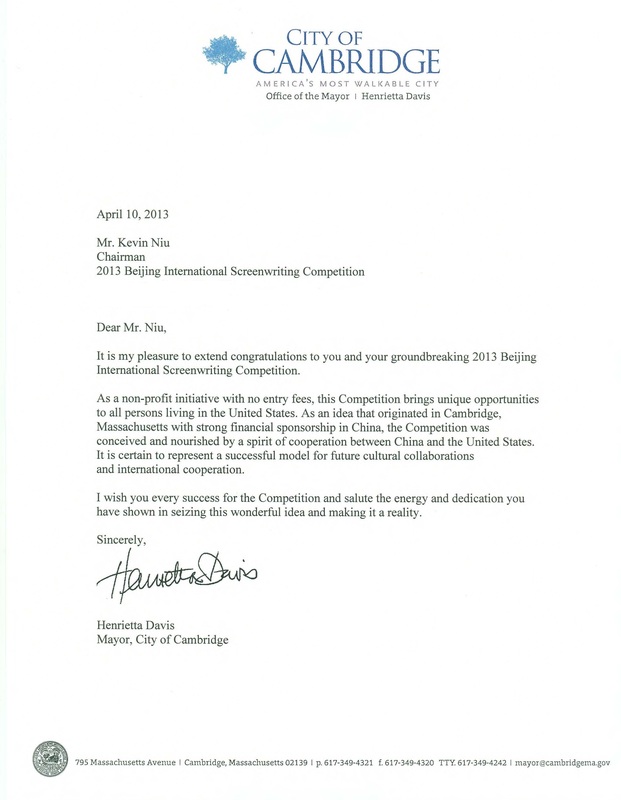 NEW YORK (May 20, 2013) — On behalf of the Cultural Assets Office of the Beijing Municipal Government, Director Huiguang Zhang announced today the winners for the 2013 Beijing International Screenwriting Competition. Open to US-based contestants of all nationalities, the “Tale of Beijing” themed competition asked writers to submit both short film screenplays and feature film proposals centered on Beijing as a location, conveying the romance, mystery and cultural richness of this great world capital. In addition to international recognition and cash prizes totaling more than $100,000, five Feature Film winners and ten Short Film winners will receive all-expense-paid trips to Beijing in June to tour the city and attend an award ceremony in their honor on June 9. In the Feature Film category, five First Prize winners will receive $1,000 each, complimentary Final Draft software, plus a 7-day/6-night all-expense paid trip to Beijing. On September 20, one Grand Prize winner will be chosen from the First Prize winners, and will receive an additional prize of $15,000. Additionally, 100 Short Film finalists will each receive a $100 gift card from AMC, a sponsor of the Competition, awarded to the best 100 submissions that were received prior to March 29, 2013. After launching in early March 2013, the Competition received nearly 1,000 submissions including from as many as 127 of the most prestigious schools, colleges and universities throughout the US. 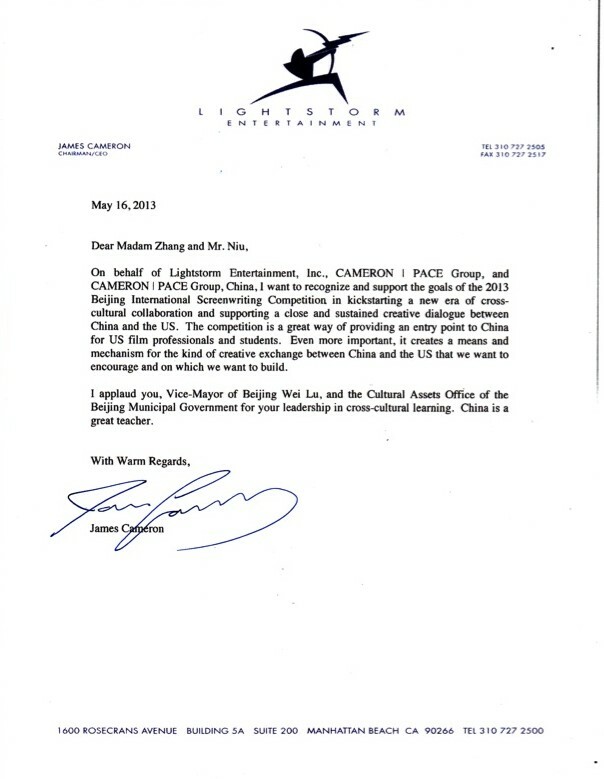 Film producer Kevin Niu serves as Chairman of the Competition, and Honorary Competition Presidents include Vice-Mayor of Beijing Wei Lu and two-time Academy Award-winning director Mark Harris. Harris, Tracey Trench, producer of The Pink Panther and Ever After and consultant for Oriental DreamWorks, and Chinese screenwriter Heping Zhang serve as the Competition’s Grand Judges. 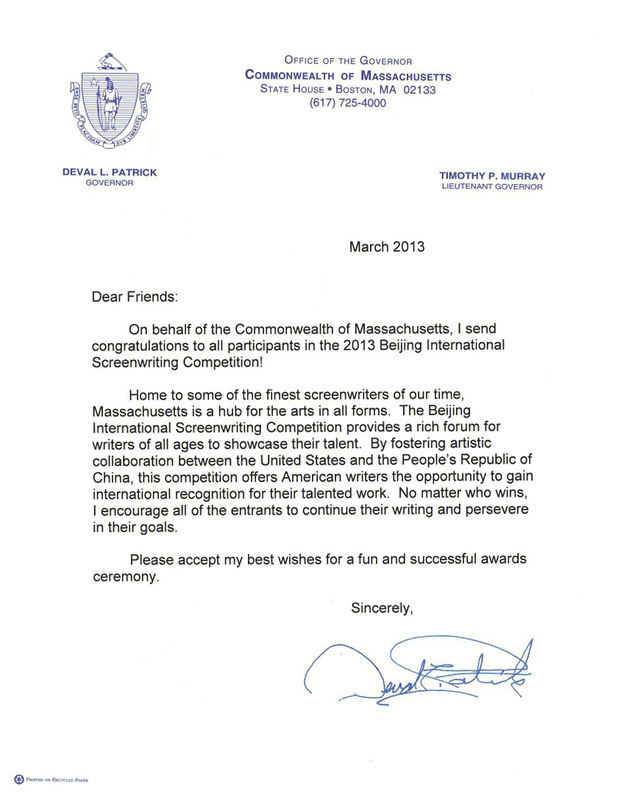 The 2013 Beijing International Screenwriting Competition is sponsored by the Beijing International Creative Industry Corporation. Other partners include LeTV and Harvardwood. For more information about the 2013 Beijing International Screenwriting Competition, please visit http://writebeijing.org/. Beijing International Creative Industry Corporation (BCC) is a state-owned cultural industry corporation under the guidance of the Beijing Municipal Committee and Beijing Municipal Government. It is the executive institution of the “Going Abroad, Inviting In” strategy implemented by Beijing Municipal Committee and Beijing Municipal Government, as well as the first international, high-end platform integrating all cultural resources. 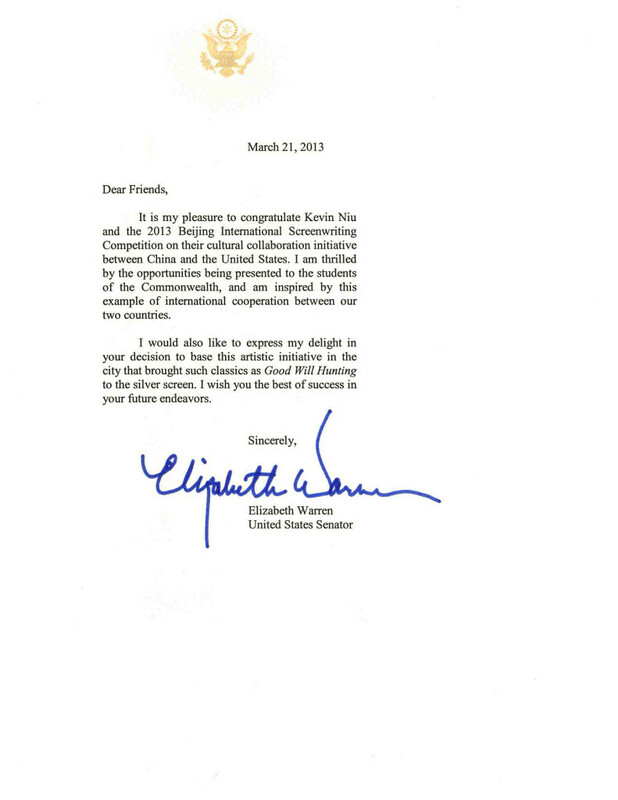 Its mission is to expand Beijing’s, and ultimately China’s, cultural influence abroad. There are three head companies under BCC, touching on international marketing, content production, and international financing and investment respectively. As the first state-owned transnational cultural corporation, BCC is committed to establishing a Beijing-centered worldwide network for cultural promotion and marketing. LeTV.com, the biggest online video content distributor for TV dramas and movies, is a division of the LeTV Information and Technology Corporation. LeTV is China’s leading cross-platform service provider, providing clients with exceptional content and technical service with high quality Internet video programming for computer, mobile phone, and television users. Established in November 2004, LeTV Information Technology Co., Ltd. was listed in the Second Board Market in China on August 12, 2010. It is the first A-share listed, online video company that focuses on research, development, and application of high-quality cyber video content technology in China. Harvardwood is a volunteer-run, nonprofit organization for Harvard University alumni, students, faculty, staff, and friends working or strongly interested in the arts, media, and entertainment. The purpose of Harvardwood is to provide information, resources, and professional opportunities for members, while also endeavoring to strengthen ties among the arts, media, entertainment, and education for members as well as the broader community. Harvardwood coordinates programs and events for its members around the world, including on- and off-campus activities for students. Additionally, Harvardwood has an active online community, including a website, alumni directory, and various email lists through which its more than 5,000 members worldwide can send and receive information regarding career-related issues, social events, classified ads, and other areas of interest. For additional information, visit the Harvardwood website at http://www.harvardwood.org. Final Draft, Inc. has published Final Draft software – the number-one selling screenwriting application in the world – for over 20 years. Final Draft software automatically paginates and formats your script to industry standards allowing writers to focus on what they do best – scripting stories. Used by industry giants, like J.J. Abrams, James Cameron, Aaron Sorkin, and more, Final Draft software has become the professional’s choice and the entertainment industry standard. To learn more about Final Draft, Inc. and its products and services, visit: www.finaldraft.com. Interested In Producing Your Script? Just Make Sure It Takes Place In Beijing! Short Films are the Future and that Future is NOW! SUBMIT FOR THE INAUGURAL BEIJING INTERNATIONAL SCREENWRITING COMPETITION!